Bonding agent applied and the waterproof sheets installed. Precision is absolute priority when sealing the shear barriers. Shear barriers on a steep slope and an aluminium eaves profile as edging. Protection mat and shear removal drainage element are installed, space is kept free for the solar panels. System substrate "Rockery Type Plants" is blown onto the roof. The vegetation mats are already installed in the steepest sections. The vegetation mats are trimmed to fit the edging area. System build-up "Urban Climate Roof"
The motorway service station on the A40 near Bochum is very impressive with its creative roof with its "Green Wave". Flat green roofs are almost a given in contemporary architecture. However, there are still far too many clients and architects who are reluctant to green steep roofs. Commissioned by Aral AG, the architect Manfred Beier courageously designed a curving green roof in the shape of a wave for a motorway service station. 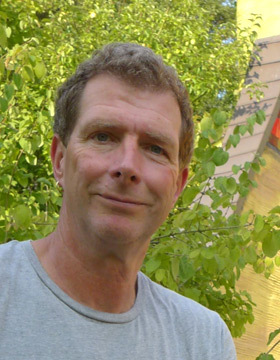 Juergen Quindeau, roofer and roof gardener, together with his team at GRUEN+DACH was able to prove that green roofs can be nice and quirky too. ZinCo supplied the appropriate technology with the system build-up “Pitched Green Roof”. From a traffic point of view, the A40 motorway is one of the main arteries in the Ruhr. It stretches over a distance of about 100 km from the Dutch town of Venlo in the west, through Duisburg, Essen and Bochum to Dortmund in the east. It is known beyond the State boarders of North Rhine-Westphalia for its traffic congestion, as it is crucial for both freight traffic and commuters in the Ruhr. However, until 2014 there was only one single service station on this important motorway and that was in the direction of Venlo. The Beverbach motorway service station didn’t open until the autumn of 2014 on the other side of the motorway, on the border between Bochum and Dortmund. The client Aral says: “With its special design and innovative concept, the service station in Beverbach is one of the most original and modern service stations of its type in Europe”. And, indeed, Architect Manfred Beier created an innovative building that is energy neutral thanks to solar panels, photovoltaic modules and the green roof. The interior design of the service station is modern and impressive with its many quirky ideas. The outside recreational area and playground are located away from the motorway. The service station can be seen from a distance as the building complex includes a re-constructed 16 m high headframe with two viewing platforms. The “Green Wave” is impressive with its curving shape and steep pitch. At the steepest point, the pitch is 32 degrees (63 %) and to get an idea of exactly what this means, you can compare it to an Alpine ski slope that is classified as a black slope upwards of 22 degrees (40 %). 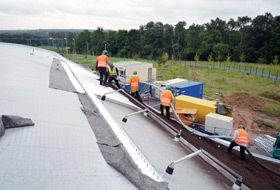 The construction of the roof waterproof membrane and the green roof had to be closely co-ordinated. The client decided that the company GRUEN+DACH was the perfect partner for the works to be carried out as they are both roofers and garden and landscape experts, that is to say, roof gardeners. They adapted the specifications to suit the different sections and the waterproofing and green roof works then began in July 2014. The basis for the roof build-up is provided by what is referred to as sandwich elements, that is, a trapezoidal flat roof system with an insulating core that is fixed to a pre-mounted structure made of curved laminated beams each of which is one metre wide and up to three and a half metres long. The outer shell of the sandwich elements is made of fully galvanised sheet steel. In order to ensure that the roof waterproof membrane stays in place, a bonding agent was first applied to the entire metal surface. 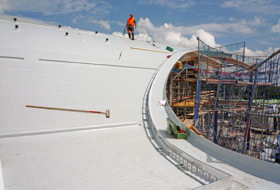 The single-layer, root-resistant roof waterproof membrane consisting of EVA sheets with underlying lamination of polyester fleece and self-adhesive film was rolled out on the roof area from the ridge to the eaves, properly aligned and by removing a separation sheet was permanently bonded with the prepared sub-surface. All the seams were then homogeneously closed using solvent welding or hot-gas welding, checked a final time and were then sealed. Root resistance is a particularly important feature for pitched roofs as an additional root protection sheet such as is often used on flat roofs would not provide a firm hold on a pitched roof. Once the surface was finished, all other elements were sealed. Vents, roof outlets, cable ducts, uprights for the safety system and consoles for the solar panels were professionally connected adjacent to the roof edge, the joints were also checked and then sealed. 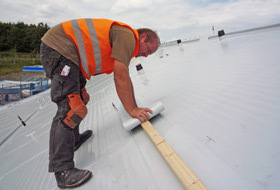 It is important to note at this point that absolute precision and quality are required for the seams because once a roof has been greened, it requires considerable time and effort to locate and remove a leak at a later point in time. For optical reasons, a gravel border was not wanted on the roof area which is why we used an aluminium angle profile edging, indented by about 50 centimetres, parallel to the roof edge. This roof edging profile DP 120 is made of aluminium, multi-edged and is 120 mm in height. 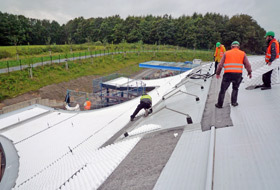 It has drainage slots and the support leg is perforated for welding the foil strips onto the roof waterproof membrane. 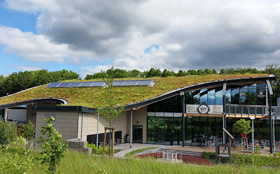 Special measures have to be taken to ensure that the green roof build-up stays in place along a total roof length between eaves and ridge of 25 metres at its longest point and with a difference in height of 5.70 metres. At the beginning, there were different schools of thought regarding suspending or bracing the green roof. Finally, the version prevailed in which the green roof build-up is supported by the shear barriers. First of all, the occurring loads that hit the shear barriers were determined metre by metre and then the dimensions of the barriers and their mountings were calculated. The lower barrier is installed at a roof pitch of 10 degrees and has a load of about 320 kg/m in saturated condition on it; the middle barrier is at 27 degrees and the load is 455 kg/m and the load on the upper barrier it is about 260 kg/m at 20 degrees. As a result, 6 x 6 cm structured timber (KVH) was run across the waterproof membrane and screwed into the sandwich elements using stainless steel screws 6.3 x 115 mm at a clearance of 25 cm. The wooden barriers were then sealed with cut outs from the waterproof membrane and uniformly welded with the surface sealing. The structural length of the shear barriers is limited to a maximum 5 metres, after that there is always a gap so that there can be no ponding effect above the barrier which would affect the appearance of the vegetation. 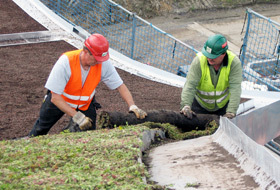 The first step in installing a green roof involves laying the Protective Sheet SSM 45, a non-rotting fibre mat made of polyester/ polypropylene with a stitched in carrier fleece. This geotextile acts not only as a protective layer for the roof membrane but can also store up to 5 l/m² of water. The second step involves the heart of the “Pitched Green Roof” system build-up: the shear-reducing drainage element Floraset® FS 75 is made of expanded polystyrene rigid foam (EPS) and is 75 mm in height with high studs for interlocking in the vegetation substrate and for absorbing substrate shear forces. It has water storage cells, openings for ventilation and diffusion and an underlying system of multi-directional channels that safely draws off excess stormwater. With a net weight of approx. 1 kg/m², it offers a compressive strength of approx. 25 kN/m². On this “Green Wave”, up to five rows or five metres of these drainage elements lean against each of the shear barriers. Due to the “difficult terrain”, the fibre mat and drainage elements were installed row by row from bottom to top; we had to be really careful at the steepest areas to ensure that the different elements didn’t slide off the roof. This was particularly the case with the roof substrate during the third stage of the work; it had to be applied from the eaves up to the ridge. The substrate was delivered in a silo truck and piped onto the roof, which required more personnel that is normally the case with a flat roof. Up to five roof gardeners held the pipe, moving it over and back across the roof, applying and levelling 100 l/m² of roof substrate. The vegetation substrate that was used, “Rockery Type Plants” for extensive green roofs, consists of Zincolit®, recycled clay bricks, and select mineral aggregates, enriched with Zincohum® (substrate compost and fibre materials). It complies with the requirements of the FLL Guidelines relating to vegetation substrates for multi-layer extensive green roofs and with the German Fertilizer Ordinance. It is resistant to sparks and frost and is structurally stable. Its maximum water capacity is approx. 40 vol. % at a volume weight of up to 1400 kg/m³ in saturated condition. 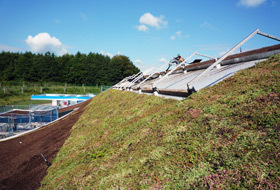 The fourth and final stage involves planting the roof substrate, for which pre-cultivated plant mats were used in the case of the “Green Wave”. These vegetation mats comprising four to eight proven sedum types on a reinforcement sheet were pre-cultivated in the open for one growing period for quick area coverage particularly for pitched and barrel roofs or roofs that are exposed to the wind. This is comparable with the cultivation and use of rolled turf or ready-made lawns, the difference being that the plant mats delivered as rolls are generally bigger and heavier. The mats used in this case were 1.00 x 2.00 m with a delivery weight of approx. 40 kg per roll. They were installed very close together, which was once again particularly challenging in the steep areas, requiring skill, strength and steadiness on the part of the gardeners. A thorough initial irrigation was the final step in the green roof works and after four to six weeks the plant mats were well rooted in the substrate and could be walked on for maintenance purposes. 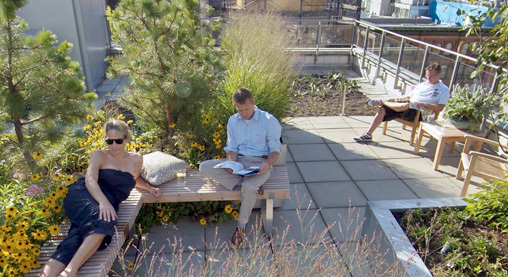 The “Pitched Green Roof” system build-up ensures a permanent firm hold and strong plant growth. The Beverbach motorway service station is indeed innovative and very striking in appearance. It is not only the headframe with its viewing platforms typical for the Ruhr that contributes to this impression but also the “Green Wave”, the 590 m² green roof on the elegantly curved roof structure. We hope that more and more clients and architects will have the courage to take on roof shapes such as this because experienced roof gardeners already have the technical means and expertise to implement them, they are simply waiting for the opportunity to be able to apply this knowledge. 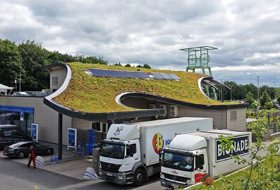 And, while the drivers on the A40 motorway don’t often have the proverbial “green wave” or “green phase”, at least they can admire it when taking a break at Beverbach service station.